The first attempts to use boron-10 for neutron detection were made in the 1970s. Due to the high neutron flux expected at ESS and the economics of the helium-3 crisis, boron is experiencing a comeback. EU support through the BrightnESS project is delivering critical results for the development of such detectors at the European Spallation Source. LUND and BUDAPEST—The European Spallation Source (ESS) is designed to be the world's brightest neutron source by a factor of up to 100. In combination with novel instrument and optics designs that will maximise the transport of neutrons from the source to the sample, this means that the instantaneous neutron flux on detectors at ESS will be without precedent. 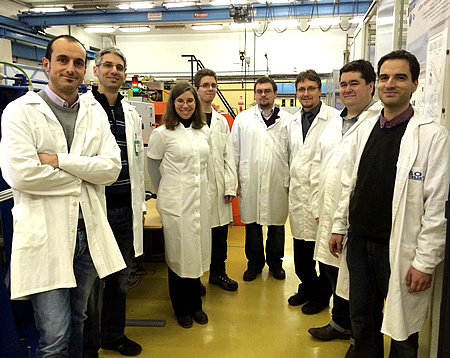 Dubbed “The Intensity Frontier”, Work Package (WP) 4.2 of the European Union-sponsored BrightnESS project at ESS aims to realise detectors optimized for these high rates of neutrons. The work in BrightnESS WP 4.2 is a collaboration between ESS, Hungary’s Wigner Research Centre for Physics, and Lund University (LU), in Sweden, and is funded through the European Commission’s Horizon 2020 Research and Innovation Programme. The project takes as its point of departure the use of boron-10 as the detector’s converter rather than the standard helium-3 gas used for most neutron detector applications worldwide. The high brightness of ESS presents a special challenge for reflectometry instruments. ESS will have two of these, ESTIA and FREIA, and is developing the new boron-based detector for both. 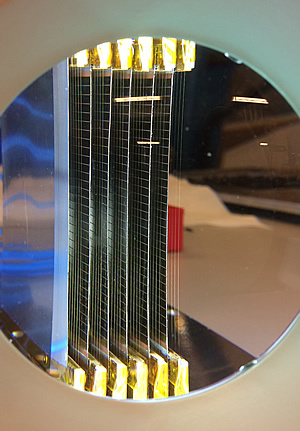 Known as the Multi-Blade detector, it is derived from a similar concept published in 2005 by a team at the Institut Laue-Langevin (ILL) in Grenoble, France. Reflectometry at ESS. Click to read more about the instruments ESTIA (left) and FREIA (right). Piscitelli has just completed the design and assembly of a new demonstrator model of the Multi-Blade that is being tested on beamlines at the Budapest Neutron Centre (BNC), a facility operated jointly by Hungary’s Centre for Energy Research and the Wigner Centre. Piscitelli’s work on boron detectors began several years ago at ILL, where his PhD centred on the development of boron carbide (10B4C) large-area detectors for the flagship ILL neutron science facility. A boron gas compound, the highly poisonous boron trifluoride (10BF3), was used for the very first neutron detectors in the 40s and 50s, and the first solid-state boron detectors were developed in the 1970s. With the Cold War in full swing, helium-3, a by-product of nuclear weapons manufacturing, emerged as a cheap and readily available source for detectors. A consensus was achieved, and research and development efforts were thereafter focused on helium-3 detectors. Following the collapse of the Soviet Union, supplies of helium-3 began to diminish. Prices have now soared, fluctuating unpredictably as national governments place controls on what remains. The challenge is to find what’s next. “Neutrons are not easy to detect, and Mother Nature has given us only a few ways. You need to transform a neutral particle, a neutron, into a charged particle, because we can only detect particles that are charged. So you need a nuclear reaction. Helium-3 reacts, boron-10 reacts, and lithium-6 reacts. There are other possibilities as well, but they are too ‘dangerous’, costly or complicated to use,” says Piscitelli. The issues surrounding the supply and demand of helium-3 are not the only factors driving ESS to develop boron detectors. Boron-10, which is a solid, allows for a flexibility in the R&D process that is lost with a gas-based detector like helium-3. The optimisations made possible by separating the detector medium from the readout mechanism are essential to improve the neutron counting rate by the eye-popping factor of 300. The Multi-Blade demonstrator has nine cassettes, each constituted of a boron carbide-coated aluminium blade strung with 32 vertical gold-plated tungsten wires, and a backing of horizontally aligned 4-mm gold-coated copper strips. These components are all mounted onto a metal frame. “Actually, it’s kind of a guitar,” says Piscitelli, describing the configuration of a cassette. The wires, which at 15 microns are about one-tenth the thickness of a strand of hair, create an electric field in the surrounding argon gas and, in combination with the metal strips, provide the x-, y- and z-axis reference points for locating charged particles released from the boron. This is where the experiment data is generated. Aside from the improvement in count rate, the Multi-Blade design is also expected to increase resolution by a factor of two or three over helium-based reflectometer detectors. The cassettes will be arranged according to the needs of a particular instrument, and will be tilted at five degrees from line of sight. The basic geometry of this five degree tilt—which increases the available surface area with which a traveling neutron can interact—is what gives the demonstrator its first factor of 10 improvement in counting rate over a helium detector. For the full Multi-Blade detector, it is anticipated that 34 cassettes will be situated in an overlapping array inside a gas-filled container. The work on the demonstrator has been carried out at ESS’s Embla workshop in Lund, which includes a fully-equipped machine shop and an area to build detector and chopper components and assemblies. The boron-coated blades are produced by the ESS Detector Coatings Facility in Linköping, Sweden. With the first prototype tested in 2015, ESS was able to demonstrate a factor of 10 improvement in count rate. Pending the BNC beamline tests, Piscitelli expects that with the new demonstrator he has already achieved another factor of five through mechanical alterations to the design and electrical components. The remaining improvements must be achieved through further detailed technical optimisations of the same sort. BrightnESS, which is now providing 100% support for the project, has provided ESS with a highly experienced partner for this next step. The Wigner Centre in Budapest will take the detector’s development out of the workshop and into software-based optimisation studies. Wigner will also look at the feasibility of incorporating Micro-Pattern Gaseous Detector (MPGD) technology, such as GEM-s, as well as corresponding electronic readout into the design of the Multi-Blade detector. The R&D for these technologies is also of interest to neutron facilities worldwide. Lund University has completed construction of the ESS source-testing facility, The Source Facility, which will be used for commissioning of ESS detectors and prototypes. The University’s experience with developing and testing detectors will be crucial for getting the Multi-Blade detector to the finish line. Other neutron facilities in both Europe and the US are cooperating with ESS and keeping a close eye on development of the Multi-Blade. The problem with counting rates in reflectometry studies is a general one, and the ESS solution could potentially be applied to existing instruments at other neutron sources.